Black 2015 Chevrolet Silverado 3500HD LTZ, 4 X 4!, LEATHER SEATS! !, JUST ARRIVED! !, WHAT A CHERRY! !, Allison 1000 6-Speed Automatic, 4WD, Jet Black w/Leather-Appointed Seat Trim, 110-Volt AC Power Outlet, 150 Amps Alternator, 3.73 Rear Axle Ratio, 4.2" Diagonal Color Display Driver Info Center, 6" Rectangular Chromed Tubular Assist Steps (LPO), Auto-Dimming Inside Rear-View Mirror, Chrome Bodyside Moldings, Chrome Door Handles, Chrome Power-Adjustable Heated Outside Mirrors, Color-Keyed Carpeting Floor Covering, Deep-Tinted Glass, Driver & Front Passenger Visors, Dual-Zone Automatic Climate Control, Duramax Plus Package, Electric Rear-Window Defogger, Electronic Shift Transfer Case, Engine Block Heater, EZ-Lift & Lower Tailgate, Front Halogen Fog Lamps, Leather-Wrapped Steering Wheel, Manual Tilt-Wheel/Telescoping Steering Column, OnStar 6 Months Directions/Connections, OnStar w/4G LTE, Power Sliding Rear Window w/Defogger, Power Windows, Preferred Equipment Group 1LZ, Radio: AM/FM/SiriusXM w/Chevrolet MyLink & Nav, Rear 60/40 Folding Bench Seat (Folds Up), Rear Vision Camera w/Dynamic Guide Lines, Remote Keyless Entry, Remote Vehicle Starter System, Single-Slot CD/MP3 Player, SiriusXM Satellite Radio, Steering Wheel Audio Controls, Trailering Equipment, Unauthorized Entry Theft-Deterrent System, Universal Home Remote. Doing Business in the area for over 40 years. 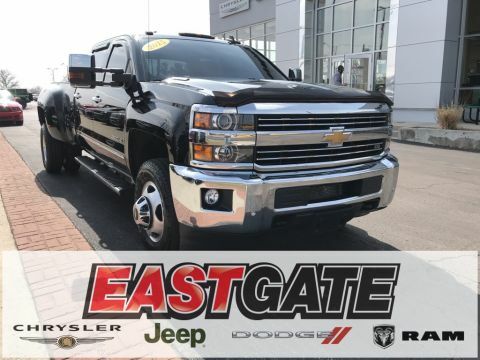 Call Eastgate Auto at 317-352-9361 for details on this vehicle or to start your EAZY DEAL at Eastgate!! By submitting an inquiry on this vehicle you are agreeing and consenting to our dealership contacting you by telephone, text messaging or other means concerning your inquiry, potential vehicle sale or promotional offerings by our dealership and other information. By participating, you consent to receive recurring text messages sent through an automatic telephone dialing system. Message and data rates may apply. To opt out of receiving these communications text STOP to (317) 483-0212.